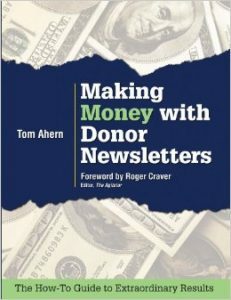 Tom Ahern, one of the world’s foremost authorities on donor communications, reveals the secrets behind highly successful and shockingly lucrative charity newsletters. Inside this fast and practical guide, you’ll find all the training and checklists you need to succeed even if you’re a novice, even if you don’t consider yourself a professional writer. You’ll discover the trailblazing Domain Formula for print newsletters, a guaranteed money-maker countless charities have adopted. You’ll learn best practices for e-newsletters, too. You’ll steer clear of the nine common fatal flaws that kill most newsletters. And you’ll see why a strong newsletter is vital to improving donor retention … one of today’s highest priorities in fundraising.